After King Khan Hrithik goes ‘Breakfree’!! After wooing audiences with superstar Shah Rukh Khan’s item song for Krazzy 4, Rakesh Roshan and Director Jaideep Sen are all set with one more ace up their sleeve- an item song by dance king Hrithik Roshan!!! The film is set to create a record of sorts with two superstars stars having their item numbers choreographed to the tunes of one song, “BreakFree”. The promos of the stunningly choreographed Hrithik song will start airing this week. It is touted to have some of his best dance moves ever! Krazzy 4 is a light-hearted comedy focusing on four Krazzy guys – Arshad Warsi, Rajpal Yadav, Irrfan Khan, Suresh Menon along with Juhi Chawla. Releasing on April 11, 2008, it is directed by debutant Jaideep Sen and produced by Rakesh Roshan under his banner FilmKraft. That Aamir getting (read ‘championing’) social causes and eventually getting embroiled into controversies is nothing new. However, this time, it has stretched a bit too far. It was just recently, that it was announced that Aamir ‘The Perfectionist’ Khan would be one of the Olympic torchbearers, something that the Tibetan community in India has raised objection to. They have told Aamir to simply distance himself from the Olympic torch relay that is to be held in China in 2008, so much so that a young protestor went to the extent of threatening self-immolation, if Aamir did not yield to the protests. The reason cited for this protest is to express solidarity with the Tibetan struggle for freedom from China. Wonder what Aamir will have to say about it! To start with, when Fardeen Khan opted out of the project [the dates were clashing with HEYY BABYY], the makers approached John Abraham for the part. John heard the script, but declined the offer because he didn’t want to portray a negative role [didn’t he win accolades in DHOOM?]. The role went to Akshaye Khanna. Before Bipasha Basu came into the picture, the role was initially offered to Priyanka Chopra. She too, like John, didn’t like the idea of playing a negative role interesting [although she won tremendous praise for her part in Abbas-Mustan’s AITRAAZ]. Bipasha was the next choice and when she heard the script, it was a ‘Yes’ instantly. Anil Kapoor too wasn’t the first choice for the part of the investigating officer. This role was first offered to Ajay Devgan, who loved the script, but felt that he wouldn’t like to do a strong, intense film then. Akshay Kumar was approached next. The actor shares a terrific rapport with Abbas-Mustan, but he declined the role because he didn’t want to play a secondary role. Akshaye Khanna is on Cloud Nine and rightly so! His work in RACE has come in for tremendous appreciation and most importantly, its success at the box-office has only added to the excitement. Shooting for SHORTKUT in Bangkok, the actor confides in me that no one expected RACE to work in such a big way. “Of course, all of us were confident that it would work big time, but the numbers have caught everyone unawares,” he sounds elated. Akshaye now looks forward to his next release MERE BAAP PEHLE AAP, which brings Akshaye and Priyadarshan together after a gap of few years. “It’s a fabulous film. In fact, I’d like to say that it’s Priyan’s best film so far,” he beams. Coming from someone whose name is synonymous with qualitative cinema, it only increases the expectations from this film. If Emraan had his way Jannat would remain smooch-free. “But then my director Kunal Singh got greedy,” he says with a twinkle in his eyes. “He first persuaded me to do one kiss, then another.” Emraan who turned 29 on March 24 was quite sick and tired of kissing…and cutting cakes. Though real-life cricketers play the field in Jannat, they aren’t modelled on any real cricketers. Does Emraan get on the field at all? “Actually I don’t like cricket at all. Don’t play it and hardly ever watch it. Fortunately, I play a bookie. So I don’t have to play in Jannat, he mumbles sheepishly like a brat boy who hasn’t done his homework. UTV’s new project, Dhoondte Reh Jaoge, which took off on Sunday was suddenly hero-less …until Sonu Sood stepped in with gallant dexterity. Hua yun ke, Dhoondte Reh Jaoge ke liye the cast read Zayed Khan, Kunal Khemu, Paresh Rawal and Soha Ali Khan. But then Zayed begged off at the last minute. Apparently, UTV and Zayed couldn’t agree on the price factor. 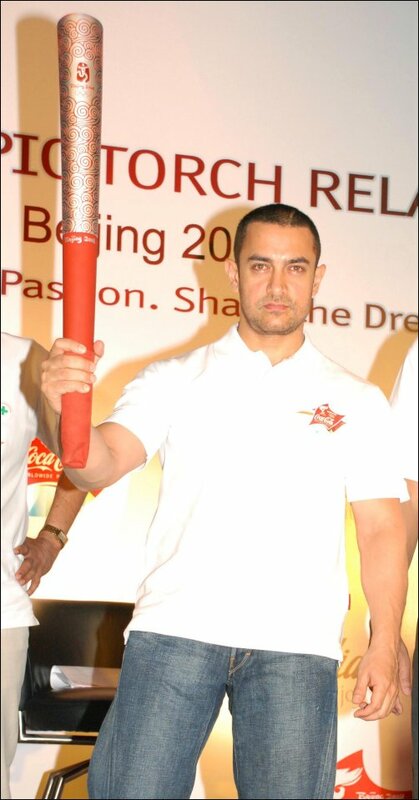 Coca-Cola India recently announced torchbearers for the Olympic Torch Relay and present among them was Aamir Khan. The six torchbearers were from diverse fields like Cinema, Government, Corporate house, NGO, Science and grassroots. The criteria of selection involved short listing luminaries, who besides having excelled in their respective fields should have also demonstrated commitment to the cause of environment stewardship and Aamir was asked to represent Cinema. All the selected environmental champions would run with the Olympic Torch as part of the worldwide Beijing 2008 Olympic Torch Relay. In the month of March 2008, the Olympic Torch Relay began its round-the-world tour that includes one-day relay in Delhi. This would be the largest Relay in the history of the Olympic Games, covering approximately 137,000 kilometers (85,128 miles) over a span of 130 days and traveling to all five continents represented by the Olympic Rings.